We have now reached the end of our three year investigation into using key ideas for teaching and assessment in Religious Education. We have shown that using the key ideas consistently has helped to increase children's understanding of the content of their faith and they have made accelerated progress with this. Our next step will be to continue to build on our knowledge-base, continue with our staff formation plans where every teacher is working towards, and some have achieved the diploma in Religious Education and to integrate RE more consistently throughout the curriculum. The main focus of meaning-making with RE will be to help the children scaffold the knowledge they pick up from RE into lifestyle. By “style” I mean the way in which they live their lives. Through our integrated inquiry curriculum we will seek to help our children understand they view the world through a lens even without knowing it. We want them to become aware of the Catholic Christian lens and help them view the world with these eyes. This will be our next step towards helping our children become fully integrated Catholic Christians. 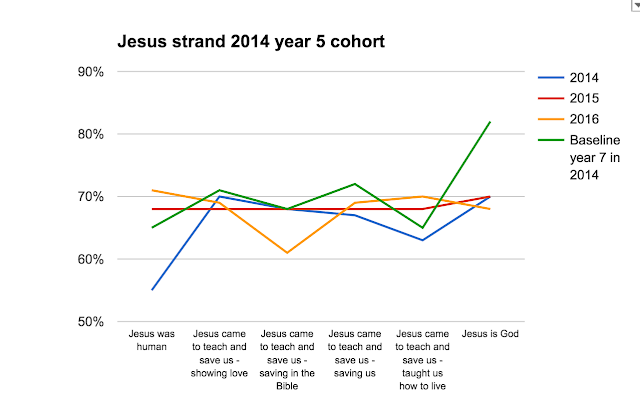 - Discuss How to raise understanding about Jesus for our present year 8 cohort (see analysis below). Anything else you pick up from that analysis? 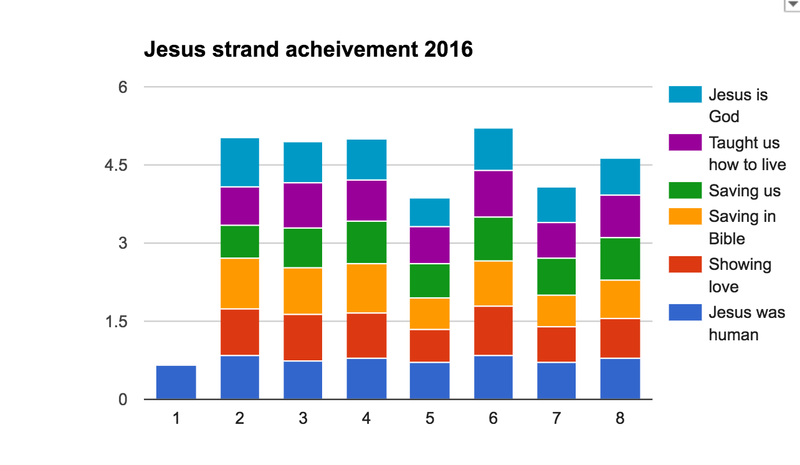 - Discuss Looking at the Jesus strand achievement for 2016 (below - third chart) - are there any trends or areas of strength/weakness that you can identify? We will continue to use the key ideas as the "coat hanger" for our RE teaching. I will make posters so everyone has the same key ideas clearly displayed. - Discuss Look at the Jesus page and come prepared to talk about any areas you would like to clarify further. This is your basic teaching guide for the strand. Make sure you read the theology section from your strand book (also on Jesus page) thoroughly. - Also look at the For parents - Jesus page that has some links you can use to underline the basic things we need the children to hold on to. This needs to be reinforced year after year, and in between times - could be used for prayer. - Look at your strand book and start thinking about which learning activities will help the most. If your strand misses some of the key ideas you need to make sure you include them in other ways in your teaching. Also look at the Faith Alive website (password on board in staffroom) which has the strand book updated with interactive links. - Present: Share one thing you have done in the past for the Jesus strand preferably at your level (or another level if you've moved, or if you haven't taught it before something from your strand book that you think will be good). - Consider: How can we make the key ideas about Jesus explicit in our inquiry this term - alongside our Carlitas work for Lent? The master doc for your planning: RE planning please copy this, give it your own name and move into your shared 2017 planning folder. Thank you. The named years are they year they were in 2014, so the year 7 & 8 groups from the past two years don't show. The year 1 group from 2014 were year 3 in 2016. In the first year the red line shows the overall level of understanding of all the key concepts in the Jesus strand. The blue line shows the understanding of the year group two years ahead. Year 1 is not representative but year 3 is a good illustration. The 2014 total understanding is not high. But the year group (year 5) two years ahead is high and the 2014 year 3 group would be aiming for that in 2 years time. If our way of doing it has value we would hope they would exceed the baseline by the 3rd year. The yellow line shows most classes did this. The green line for the 3rd year is on the whole ahead of the previous year and a long way ahead of the baseline. So overall, this indicates that our children have an accelerated understanding of the key ideas over a three year timeframe. The exception is the year 5 group, who were year 7 in 2016. Their understanding remained low and and did not meet the baseline of the 2014 year 7 group. This is useful to know as it indicates there can be some difficulties within cohorts and when we know there is a particularly weak understanding (averaged out) in one cohort, we can put in strategies to try to lift achievement for that cohort. Is there anything in this chart that we need to notice? Any areas of weakness or strength?